After his latest mission goes disastrously wrong, veteran CIA black ops agent Emerson Kent (John Cusack) is given one last chance to prove he still has what it takes to do his job. His new assignment: guarding Katherine (Malin Akerman), a code operator at a top-secret remote CIA “Numbers Station” where encrypted messages are sent and received. When an elite team of heavily armed assailants lays siege to the station, Emerson and Katherine suddenly find themselves in a life-or-death struggle against an unknown enemy. With the station compromised and innocent lives at stake, they must stop the deadly plot before it’s too late. When I last saw John Cusack, he starred in the direct-to-video thriller The Factory. Now Cusack’s back… with another direct-to-video thriller. Well, I guess consistency counts for something. In 2013’s The Numbers Station, we learn about government locations that use CIA operatives to decode sent/received secret messages. When his latest mission goes awry, black ops agent Emerson Kent (Cusack) gets a negative psych eval and leaves active duty. To allow him time to regroup, Kent receives a seemingly simple, relaxed assignment to “babysit” analyst Katherine (Malin Akerman) at a remote British location. Inevitably, the situation becomes more complex and Kent needs to team with Katherine to ward off an attack. With its claustrophobic setting, Station comes with some promise. It operates on a bit of a Die Hard framework, as the hero needs to improvise in a tight circumstance to battle off a ruthless foe. Alas, Station doesn’t do a lot to exploit potential excitement. This is a pretty restrained thriller, as it largely eschews action and instead prefers creepy atmosphere and attempts at psychological involvement. Those could’ve created an involving tale, but Station remains too one-dimensional to explore its subjects in a satisfying manner. In theory, the plot should capture out attention, as it doesn’t telegraph too much; we learn dribs and drabs about the baddies as they attempt to execute their plan. Unfortunately, those bits and pieces don’t add up to much, partly because the film prefers to spend more time with interpersonal interactionship between Kent and Katherine. Some of this makes sense, as their bonding means Kent will find it more difficult to do his job, but these moments occupy too much of the story. When I see a thriller, I kind of want some thrills, you know? The story’s construction doesn’t help. Much of it plays in flashback, as Kent and Katherine piece together their situation via recordings they find. This creates a clever take of sorts, but it also leaves our leads inactive too much of the time, as we often get stuck with shots of Kent and Katherine as they do nothing but sit and listen. As for the actors, they have their charms. Akerman does her best to bring life to the tale, and Cusack shows a certain dark depth in his role. Neither gets much with which to work – and I think Cusack does better in comedy – but at least they bolster the movie as much as they can. They just can’t redeem a generally slow, lifeless narrative, though. Numbers Station isn’t a complete loss, as it delivers enough intrigue to keep us with it. However, it never becomes better than average and it squanders its potential to turn into something stronger than that. 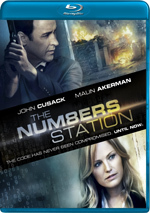 The Numbers Station appears in an aspect ratio of approximately 2.40:1 on this Blu-ray Disc. While not dazzling, the image looked fine. Sharpness was usually positive. A little softness occasionally interfered, but those instances occurred infrequently. The majority of the movie appeared concise and accurate. No issues with jaggies or shimmering occurred, and I saw no edge haloes or print flaws. Like many modern thrillers, Station went with a palette that favored chilly blues. It veered warmer at times – such as with red lighting - but the teal overlay remained dominant. Despite that, the colors remained appropriate. Blacks seemed fairly deep and tight as well, and shadows showed reasonable clarity. This became a pretty good presentation. I thought the DTS-HD MA 5.1 soundtrack was adequate for the material. Much of the film remained chatty, but occasional action sequences opened it up a bit. We got gunfire and other tidbits in various spots around the spectrum, and these added some life to the proceedings. Music also showed appropriate stereo presence as well. The soundscape wasn’t great, but it worked. Audio quality was fine. Speech sounded natural and concise, without edginess or other issues. Music showed good range and heft, while effects were acceptably accurate and clear. This never became a memorable mix, but it was more than sufficient for the story. A Making Of Featurette goes for 14 minutes, 25 seconds and includes comments from producer Sean Furst and actors John Cusack and Malin Akerman. They discuss story/character subjects, cast and performances, and the film’s setting. We basically just get a recap of the movie’s plot, so don’t expect to learn much from this dull featurette. The disc opens with ads for The Tall Man, Day of the Falcon and The Double. No trailer for Station shows up here. While not without positives, The Numbers Station feels a bit limp most of the time. It benefits from a good cast and concept but doesn’t exploit them to its best advantage. The Blu-ray delivers generally positive picture and audio but skimps on bonus materials. This is the kind of movie to watch when you’re flipping channels and want to kill some time.